Union Minister Shri Babul Supriyo represents the energetic youth leadership of BJP in West Bengal. 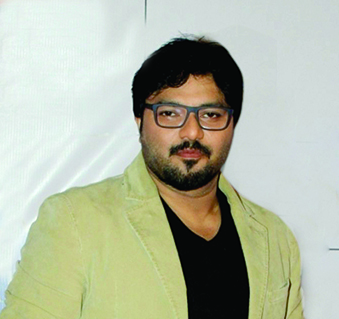 Starting his career as a playback singer and actor in Bollywood, Shri Supriyo won the 2014 Lok Sabha elections as the BJP candidate from Asansol in West Bengal and was inducted in the Modi government as the youngest Union Minister. Before assuming the charge of Minister of State for Heavy Industries and Public Enterprises, in the Government of India on July 2016 he handled the responsibility of the Ministry of Urban Development, Housing and Urban Poverty Alleviation successfully as its State Minister. Known for his frankness and innovative approach in implementing various welfare schemes of the Union government with great success, he faced many challenges in his own State which has been in news in recent times for rising cases of violence, crime, administrative chaos and underdevelopment. Once upon a time Bengal was the cultural and industrial powerhouse of the country and was the land that produced some of the tallest leaders of our contemporary society. It was known for spearheading cultural and intellectual revolutions that inspired the nation. It had emerged as an island of hope for millions of youth and job seekers during 1940s & 50s. However, the scenario has completely reversed in the past 40 years. What factors do you think are responsible for the overall deterioration of Bengal? Sadly, I have to agree. Bengal produced some of the greatest human beings of our society like Sri Chaitanya, Ramakrishna, Vivekananda, Tagore, Subhash Bose, Dr. Mookerjee and many more freedom fighters and social reformers. During the pre-independence period Bengal was the epicenter of the freedom movement and was a major hub for industry and education. However, when the Left parties came to power the decline of the state started. Disregarding the responsibility bestowed up on them by the masses, they lost their Vivek or Commonsense and indulged in violence and misgovernance. In around four decades of Left rule, corruption and crime ruled the state. Instead of development, the Left took it backwards and ruined the very backbone of West Bengal. To hide their non-performance and failure, they perfected the art of winning elections through violence and by suppressing the voice of opposition. After the destructive Left rule, power passed to the hands of the TMC. All were hopeful that Under Mamata Banerjee West Bengal will regain its glory and can emerge as a developed state. But unfortunately, CM Mamata Banerjee betrayed Bengal. Instead of cooperation with the Central government for the faster development of the state, the TMC government has adopted a confrontationist approach for narrow political gains. Now, the irony is, TMC government is not even responding to the Central Government. CM is not even attending meetings called by non-other than the Prime Minister of the country. Its Ministers are not attending the Central Meetings. The Left definitely ruined West Bengal and they have taken the State to the point of no return but this Government has touched a new low so far as its political behavior is concerned. Instead of overall development, Mamata Banerjee is indulging in vote bank politics. She came with the slogan of ‘Parivartan’, but ‘Parivartan’ has not happened anywhere in the state. Agriculture is ruined, businesses collapsed, industries closed down, job has dried up from the state and finally people are forced to migrate from the state. If any ‘Parivartan’ has taken place, than it is visible in the life style of TMC leaders itself. The CM is trying to choke the throat of democracy even for genuine opposition. Now Bengal is known for its anti-democratic activities and there is lot of degeneration in the political culture of the state. As Bengalis we are feeling ashamed for this act of the government. Under this government Bengal is deteriorating further and it symbolizes the decline of a great state. From the recent incidents one thing is clear that TMC workers are attacking the opposition leaders, their houses, party offices and supporters of opposition parties. What message the TMC wants to give through state sponsored terrorism and hooliganism? As you know, in the recent past the TMC workers attacked State BJP headquarters in Kolkata, attacked senior BJP leaders like Smt. Krishna Bhattacharya, burnt the houses of Hindus in Dhulagarh village in Howrah district, Malda and other places of the state. It seems that, under CM Mamata Banerjee the law and order situation in the state has been worsening day by day. Secondly, the language which the political leaders sitting at the helm of affairs in the state are using, their behavior against the opposition, their attitude towards the Union Government and the law and order situation in the state shows that the Mamata Banerjee led TMC Government has already deviated from the Democratic path. Their way only leads to Corruption, Crime and hooliganism. So, whatever is happening in Bengal the responsibility lies with none other than the CM. Thirdly, it appears as if there is a competition going on between the TMC politicians, from bottom to top, in the use of abusive low grade language against the opponent leaders. Even the TMC high commend was rewarding those people who are attacking the activists of the other political parties. The State Police is seen either remaining silent or supporting the goondaraj of TMC workers. In one hand the TMC workers didn’t spare a Central Minister, attacked me with stones, but state police was mute spectator to the entire event. However, on the other hand Bankuda Superintendent of Police, Bharati Ghose has given speeches from the dias of CM Mamata Banerjee in her presence supporting her party. It shows and confirms the involvement of West Bengal government and police in all these criminal offences that has been taking place in the state. TMC has imitated the Left way of rule in Bengal and Kerala. Therefore, the only motive behind these criminal activities of the ruling party is to create fear in the minds of the people and suppress and choke the throat of the opposition. As a responsible opposition party how BJP will bring the state out of the vicious cycle of violence, crime and chaos? BJP is rising day by day and Mamata Banerjee is getting scared to see the phenomenal rise of the organisation. That’s why she is instructing her workers to physically attack our student leaders and political activists. However, violence and crime has no future in a democratic setup. Our leaders like Hon’ble Prime Minister Shri Narendra Modi and BJP National President Shri Amit Shah always believe in constructive politics and they believe that development is the only solution for all problems. Therefore, for us development, development and development is the only solution for all the problems of West Bengal. Our Karyakartas spreading the consciousness among the citizens and trying to unite the Bengalis in the State against TMC sponsored violence and crime. I am hopeful that consciousness will come among the public very soon and in a democracy the public will give the fitting reply to this lawlessness and anti- democratic rule of Mamata Banerjee. Sharadha to Rose Valley, many mega chit fund scams surfaced under Mamata Banerjee rule in the state. CBI found the involvement of Ministers and MPs of TMC in these scams and some of them are in jail. What’s your reaction to it? In Sharadha, Rose Valley and other chit fund scams there are enough evidence available against the people who are involved. These are white collar financial crimes. So, the CBI after proper investigation has arrested some of them and will definitely nab those culprits who are still outside the orbit of law. Once upon a time, Mamata Banerjee fought against corruption but now she protects the corrupt and corruption. In the coming days it will ruin the TMC and will allow the BJP to rise and emerge as the biggest Political force in the State. As the Union Minister from West Bengal, what is your vision for the development of the state? Once upon a time Bengal led other states in Industrialization but now it is going backwards. Nobody is showing interest to invest in West Bengal. Industrial units have already closed down. Employment opportunities are shrinking by the day. Majority of Youth are unemployed and frustrated. Farmers and industrialists are hopeless. So in this atmosphere of gloom the BJP as an organisation and me as a minister have been trying our best to spread awareness among the common people regarding various developmental schemes of the Central Government and our objective is the overall development of a backward State like West Bengal. We believe the welfare schemes launched by the Union government, are meant for the transformation of the state and for the upliftment of the youth, the women, the poor, the farmers and the weaker section of our society. Therefore, our main focus is on spreading the message of development among the public. Recently, I organised a ‘Sansad Mela’ in my own constituency to spread the awareness about welfare schemes launched by the Central government and the people of the state shown enormous interest in it, responded and participated enthusiastically. We will organize it in other places in the future and certainly it will help the state to come out of the atmosphere of despair. What is the future of BJP in West Bengal? Future of BJP is very bright in West Bengal. Common people know it very well that their Prime Minister Shri Narendra Modi is working round the clock, more than 18 hours a day for their development. Nobody has labeled a single charge of corruption against him or his government or its ministers after about three years of rule at the Centre. And there are no issues for the Opposition to attack the Government. Only for that the popularity and vote percentage of BJP is growing day by day in Bengal and across the Country. Secondly, in West Bengal, people are gradually realising that BJP is the only party which can bring development without any discrimination. If BJP forms the Government it can take the state on the path of development. PM Shri Narendra Modi has already shown it in Gujarat as CM and now as PM at the Centre. The States with a BJP led Government are also developing at a rapid pace in comparison to other states of the country. Everywhere, BJP’s mission is development. So, in reality we are setting examples and showing the rest of the country that development is possible even in the most backward areas of the country. Therefore, I can foresee the bright future of the State and my party. The TMC is spreading the ‘Kichhad’ which will create a favorable climate for the lotus to bloom in Bengal. The day is not far when the BJP will rekindle the glorious past of West Bengal and usher an era of rapid economic progress and faster development which has eluded the state in the past four decades.